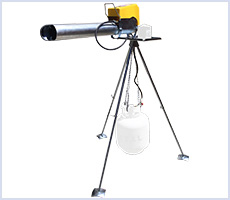 Sutton Ag is the U.S. exclusive distributor of Zon bird scare cannons and accessories. Zon Automatic Scarecrows have been used worldwide to scare pest birds and wildlife away from agricultural crops, airports, disposal sites and other critical areas since 1942. 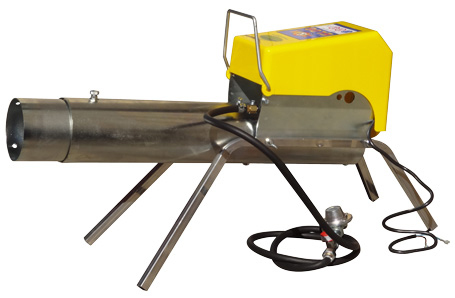 The Zon EL08 Electronic Propane Cannon provides multiple and random sonic blasts to frighten and disoreint pest birds and wildlife. Powered by economical propane, Zon guns are one of the most efficient means of bird control available. Blast volume up to 130 decibels. Sound level adjustable via telescopic inner barrel. Zon EL08 Cannon is now available in single-megaphone model. Inner / outer megaphone. Blast volume up to 130 decibels. Sound level is adjustable via telescopic inner megaphone. A full 20 pound (5 GAL) propane tank provides approximately 15,000 EL08 bird scare cannon detonations. Ignition produces more than 1 million detonations. The only moving part on the EL08 cannon is the valve that controls the gas flow. No more broken springs to replace, no worn out diaphragms - less time in the repair shop means more time protecting your investment! Zinc-plated barrel (inner/outer megaphone) on the Zon EL08 Cannon resists corrosion. 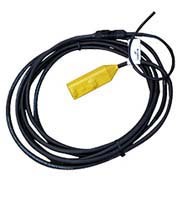 Electronic timer provides 2 different random blast interval settings for the EL08 cannon (1 to 10, and 1 to 20 minutes). (Older EL08 cannons are capable of 3 random settings: 1 to 5, 1 to 10, and 1 to 15 minutes). There's no need to purchase a separate on/off timer. 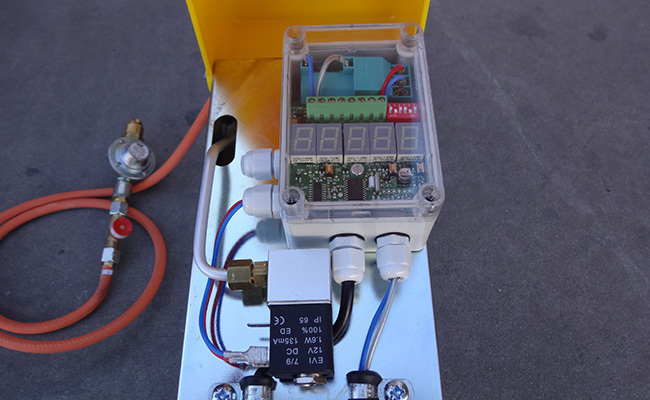 The EL08 cannon includes a 24-hour timer that can be programmed with up to 4 daily on/off periods. The Zon EL08 includes an auxiliary input for optional control by the Push-Button Zon Bird Scare Cannon Activator. The Zon EL08 comes standard with legs that stand it about one foot off the ground. 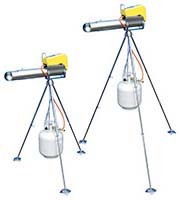 An optional rotating tripod is available to elevate the cannon and required 12V battery. One cannon will protect from one to five acres, depending on the shape and topography of the area. 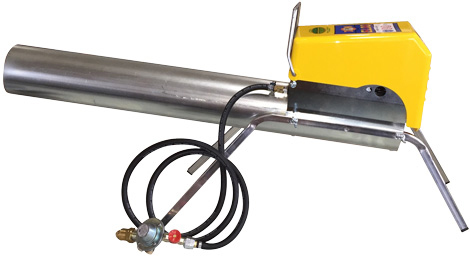 Operation of the Zon EL08 cannon requires a propane tank and 12-volt battery (sold separately). Yes, with addition of the Push Button Zon Cannon Activator. Not needed. The Zon EL08 features a built-in timer. Yes. The 4' tall electronic cannon Tripod is available. Yes. 4.5' Tripod can be made taller with the addition of 1 or 2 Tripod Extension Kits. Yes. We offer an economical propane cannon repair service with quick turnaround. Please allow more time turing the busy season (summer months). Along with an industry standard warranty, Zon cannons and accessories manufactured by Dazon are backed by over 7 decades of manufacturing experience and expertise. Since 1942, Dazon has been the foremost leader in the manufacture and design of bird scaring cannons, and continues to innovate to this day. 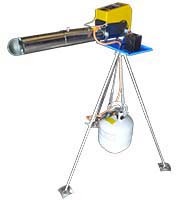 Zon cannons remain the most effective, reliable, popular and affordable bird scaring cannons in the world.